I love the amazing rings on the print of this dress. Even more so when I look at these photos. 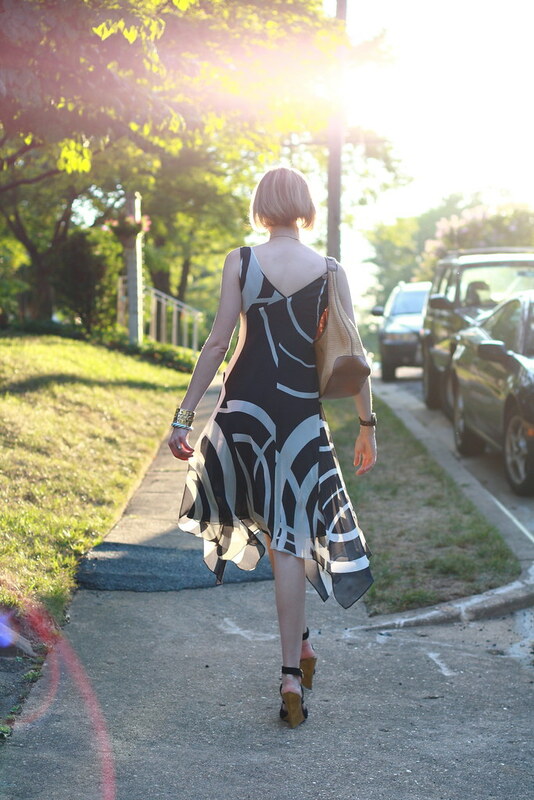 I seem to have a penchant for dresses that look cooler when they move. The hem detail and silhouette of the dress is remarkable. You look so classy and such perfect summer evening wear! I absolutely love the entirety of this dress. The print and the hem on the dress are just amazing and you are right, when you move the print is even better. Lovely! those shoes are so cool, I love this look and the photos! Your style is so feminine and beautiful! Love the shoes! Another beautiful dress on a beautiful girl. I love how it drapes! You look great! Such a lovely silhouette! Have a great week! love the way the light hits your hair in these! so pretty. and great swanky dress! Every time you post those shoes I turn green with envy. They look wonderful with the dress! really pretty dress, it really suits you well. I love the hem and print on your dress. That dress really does have some great movement – and the restaurant sounds fabulous! Those are some fierce heels! Great look, love the texture of the dress. I really like the details of this dress, very pretty. love this dress with asymmetrical hem. I'm with you, I favor dresses and skirts with movement. Reminds me of being a little girl, twirling every time I wore a dress! You look beautiful, love those shoes! Lovely print! This dress is a perfect choice for a summer evening! So classy, and I love the wedges with the hemline of the dress. Gorgeous. You quite fancy. I love the print of the dress. beautiful dress! love the light in the pictures! i just can't get over the lighting in these photos… you look angelic! Very gorgeous. I'm wearing a pair of flowy pants today and I could not be happier. You always look so feminine and elegant! Very pretty dress, I like the asymmetrical hemline! love the dress with the ysl wedges… i love the extra gold pop from them! This is my first time to your Blog…and I love it. Looking forward to coming back and following your style. mmmm small plates. also i would like to steal that dress! Super divine dress–you look amazing. The shoes marvelously complement the dress pattern. First of all, that dress is awesome! Second, these photos are beautiful! Third, I want a dollar for every time you wear those awesome wedges, haha! I love the print of this dress! !